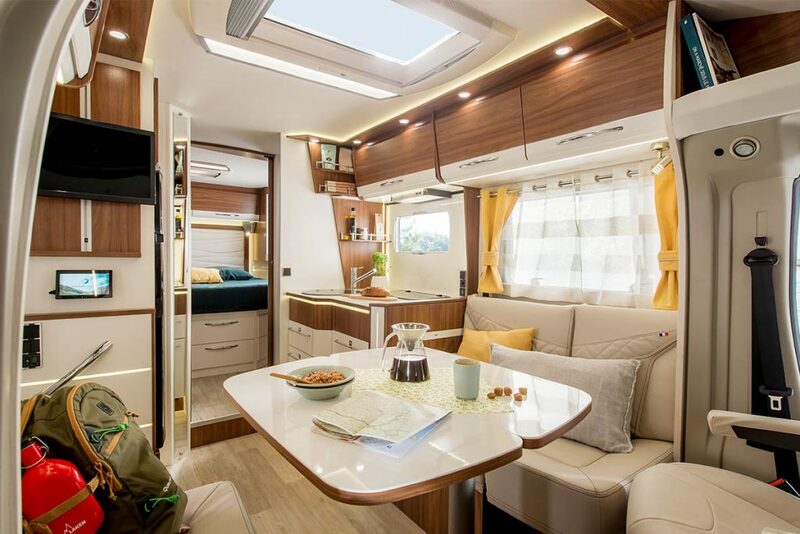 The Pacific range offers you 16 low-profile and Family range 2 overcab motorhomes, ranging from 5.99 to 7.45 metres, available in Essentiel and Sensation finishes. 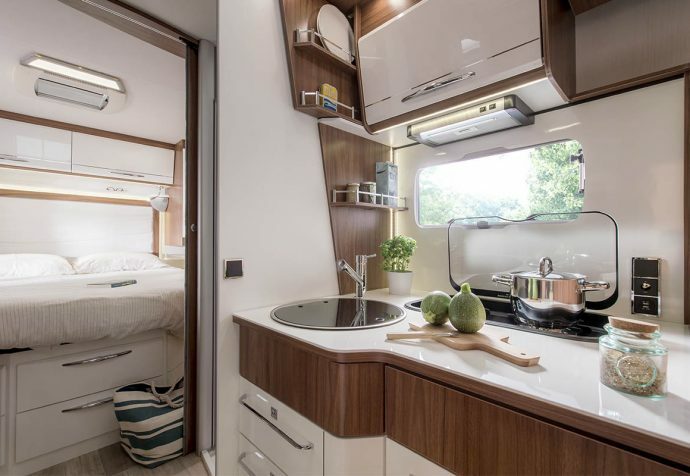 With an island bed, twin beds, a rear off-side bed, or even a U-shaped lounge at the rear, low-profile motorhomes in the Pacific range are available with or without pull-down beds. 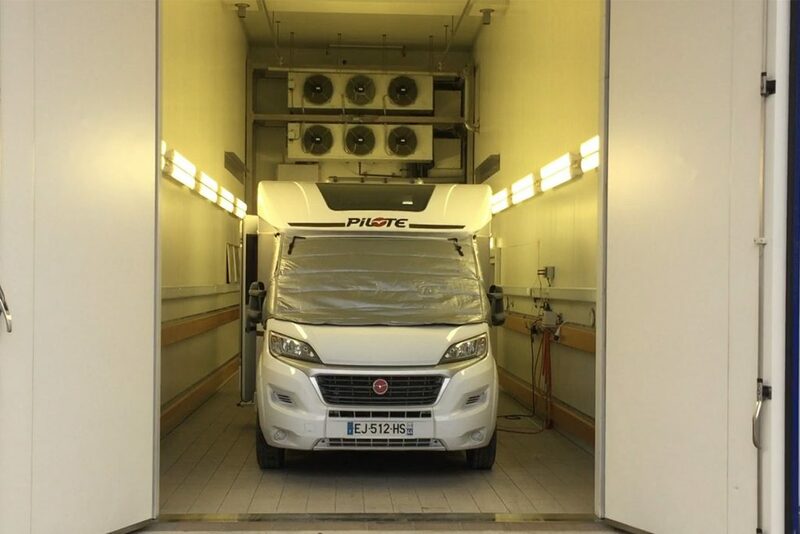 Customise your motorhome with an ALDE heating system or a fifth seated place in all motorhomes above 7 metres. With 18 models to choose from, available in two levels of finish – Essentiel and Sensation – Pilote motorhomes offer customisable configuration. The Pacific range also offers around 100 optional extras to ensure that your motorhome corresponds perfectly to your needs and preferences. You can choose from various layouts, including a garage bed, twin beds, or a height-adjustable island bed. Enjoy the spectacle of nature through the panoramic windscreen of your Galaxy A-Class motorhome. 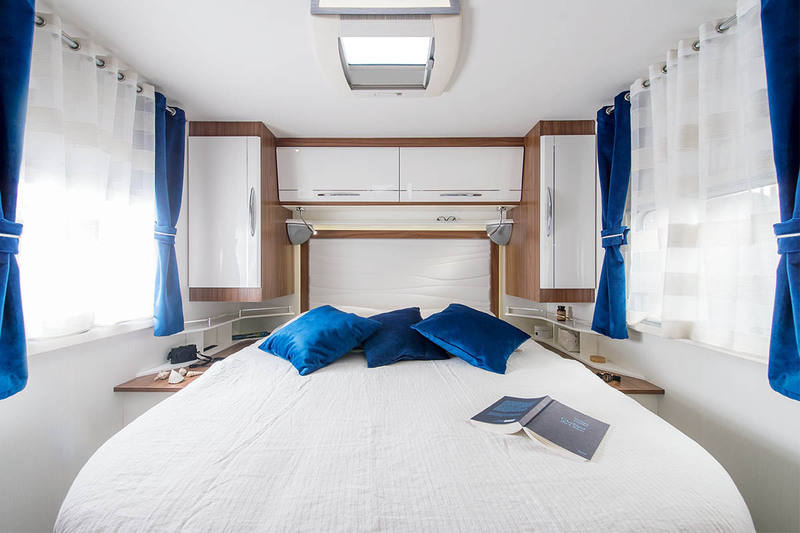 Our Galaxy range is composed of 20 A-Class motorhomes, ranging from 5.99 metres to 7.87 metres. With a 15cm Service Double Floor or a 21cm Storage Double Floor, you can choose a technical solution offering more storage areas as well as better thermal comfort. All A-Class motorhomes above 7 metres in the Galaxy range are ALDE compatible. You can also benefit from the option of a fifth seated place in all A-Class motorhomes over 7 metres. Travel far and wide with your Pilote Galaxy A-Class motorhome. With 18 models available in three levels of finish - Essential, Sensation and Emotion - Pilote A-Class motorhomes can be configured as you wish. You can choose various layouts, including a garage bed, twin beds, or a height adjustable island bed. Our motorhomes are renowned for the quality of their layouts and ergonomic floor plans. Easy circulation within the vehicle: people can pass each other anywhere within the cell. Circulation is improved by the absence of any steps in the living areas of all our vehicles. The 2 metres of indoor height provide you with an excellent interior space, with plenty of room and comfort. The cell of our motorhomes is designed for easy circulation, featuring a very large living area with L-shaped recess from the Sensation finish upwards, step-free living areas, spacious bathrooms and comfortable bedrooms. Choose comfort. A cleverly laid-out bathroom in compact vehicles. 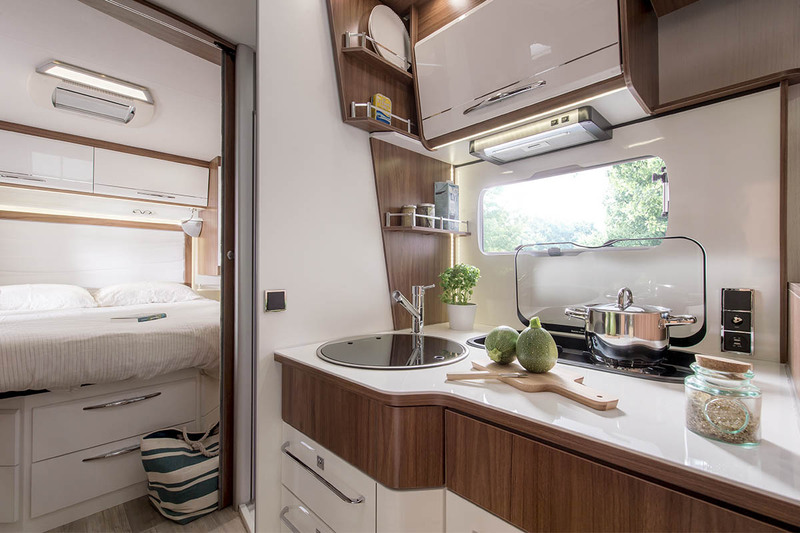 With a large saucepan drawer unit and lots of easily accessible storage spaces, it’s obvious you’re in a Pilote motorhome. The ergonomic L-shaped kitchens are, just like the range as a whole, generous and cleverly designed. Their large worktops make cooking a real pleasure. 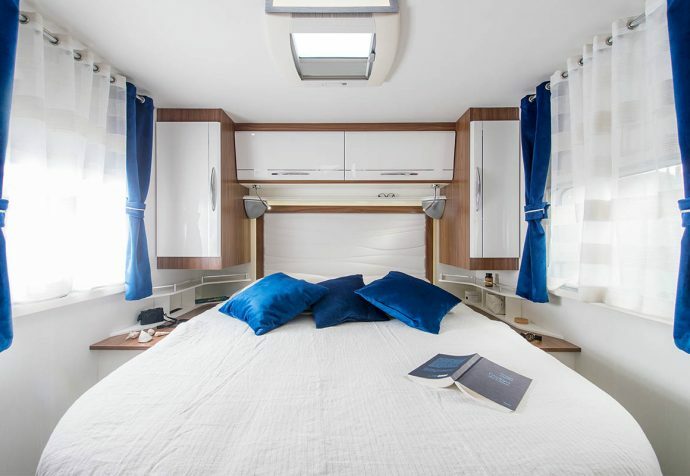 With a choice of low twin beds, rear off-side bed or island bed, there’s no need to settle for less, when you can find the motorhome of your dreams in the Pilote range. The island beds measure 150cm and retain excellent circulation spaces. 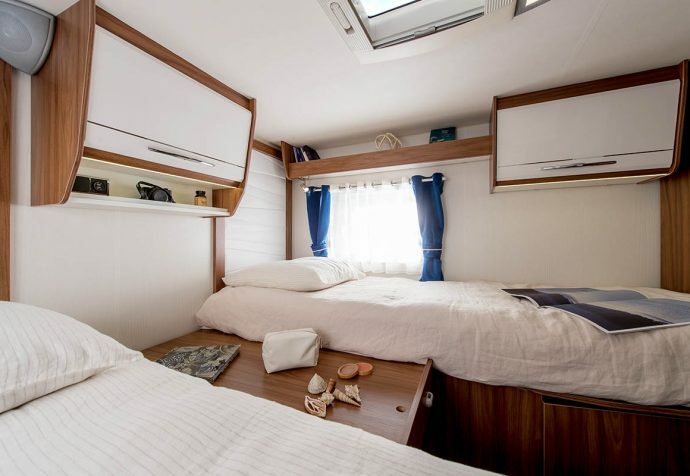 The twin beds are easy to access and allow for a very large hold, while the rear off-side beds leave room for a very large bathroom. All configurations include a Bultex mattress on a slatted bed frame. Depending on the layout, the bathrooms in the range can include combined or separate toilet and shower facilities. 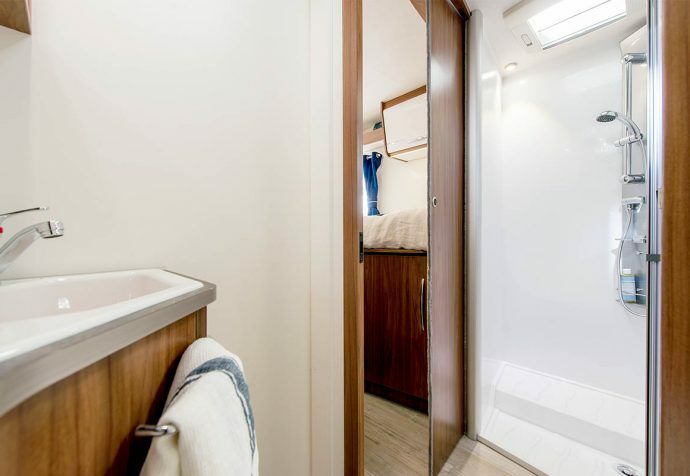 In some motorhomes, you can also enjoy a separate bathroom. Thanks to a system of double partitioning, it is insulated from the bedroom with a sliding door and from the lounge with the toilet door. Floor and side walls are enhanced with more rigid battens manufactured from fibroplast (polyurethane reinforced with fibreglass). Batten against batten, the side wall to floor connection is optimised providing greater water tightness, insulation and solidity. This well balanced sandwich provide greater rigidity. With a 50 mm thickness this new floor has proved to provide better insulation. Optimal under-chassis finish: electric cabling & ducting are integrated into the cell (except for 710). 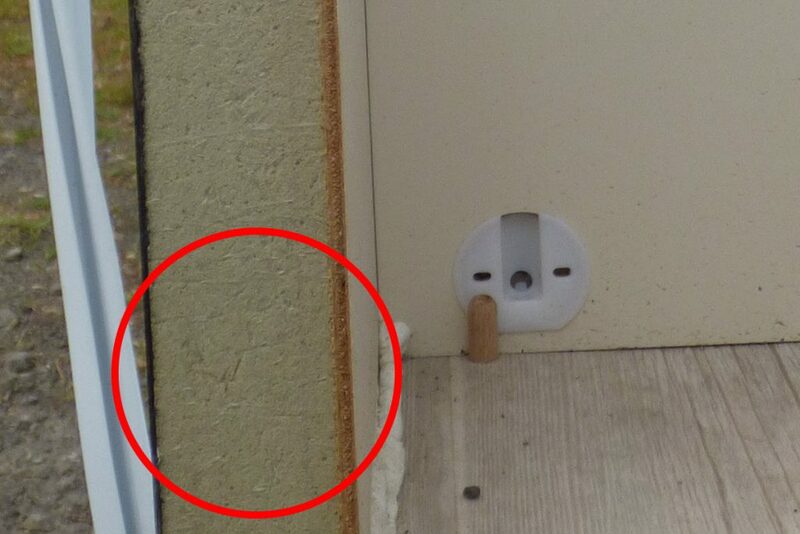 The wastewater and gas discharge pipes are sandwiched in the floor. This innovation provides frost protection, plus prevents and affect from road spray. Tested in a cold room, the Pacific range is certified as Class 3 for its insulation quality. From -15°C to +20°C in less than 4 hours in accordance with standard EN-1646-1 (measured with a Truma 6). Tested on the equivalent of 20,000km, on the most demanding track in Europe, the new structure has proven itself in every way. Optimised and updated with experts at TRUMA®, the heating circuit offers optimal and harmonious heat diffusion. Waterproofing remains optimal in the low-profile models, with new structure assembly techniques. Road tests have successfully demonstrated a reduction in various sources of external and internal noise.